Map showing the names of bay-floor and geographic features within the Apalachicola Bay study area. 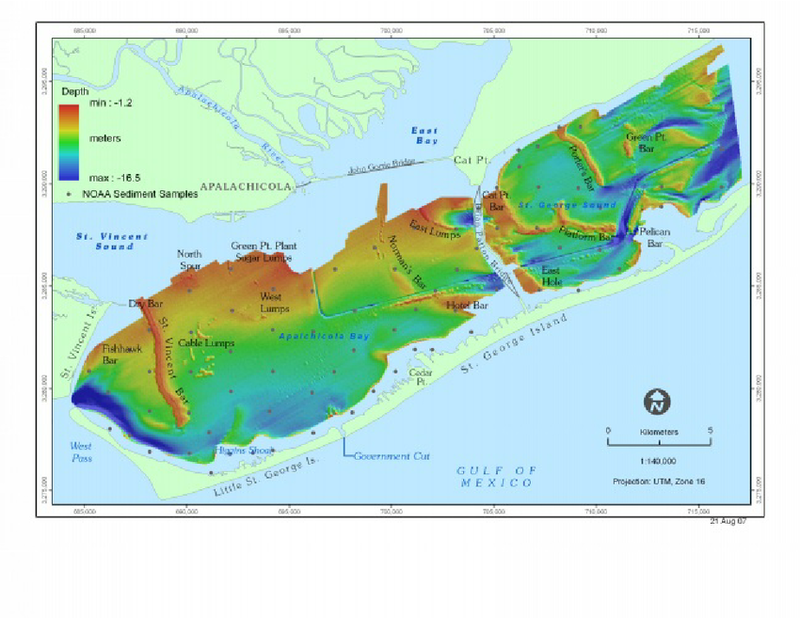 Locations of sediment samples collected by NOAA Coastal Services Center (NOAA, 1999) that were used to verify the sidescan-sonar interpretation are shown. Funding for the project will come from a grant from Triumph Gulf Coast. Triumph is a nonprofit corporation created by the Florida Legislature to oversee the disbursement of $2 billion received by the state from the 2010 BP Deepwater Horizon oil spill settlement. FSU is kicking in an additional $1.5 million of its own money for the research. Backers of the proposal included the National Wildlife Federation and the Apalachicola Bay Oyster Management group, among others. The funding was not without opposition. In a December letter, the Florida Shellfish Aquaculture Association spelled out concerns over whether FSU’s plan would put the university in competition with private businesses.